Give members more information regarding their electric use. Aid JREC in successfully resolving usage or high-voltage complaints. Be secure. JREC can only read overall electric use by members. The Co-op has no way of knowing what appliances/devices are on at any given time of the day. Report power outages and aid crews in more efficiently locating the cause of an outage and restoring power. Eliminate the need for manual, on-site meter readings by JREC. Detect meter tampering and high temperature, and automatically notify JREC of any issues. Allow for more consistent billing cycles, as well as expedited service when an account is transferred to another member. In the future, allow members the option of prepaid billing. 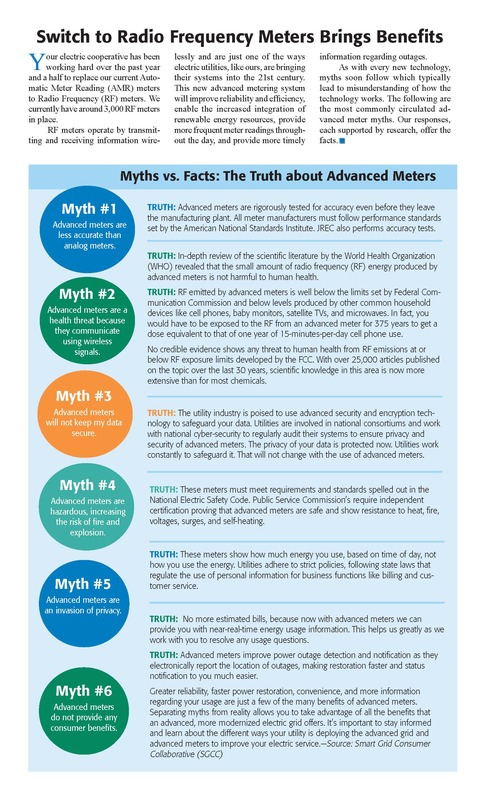 Read more about the Myths vs. Facts regarding advanced meters.